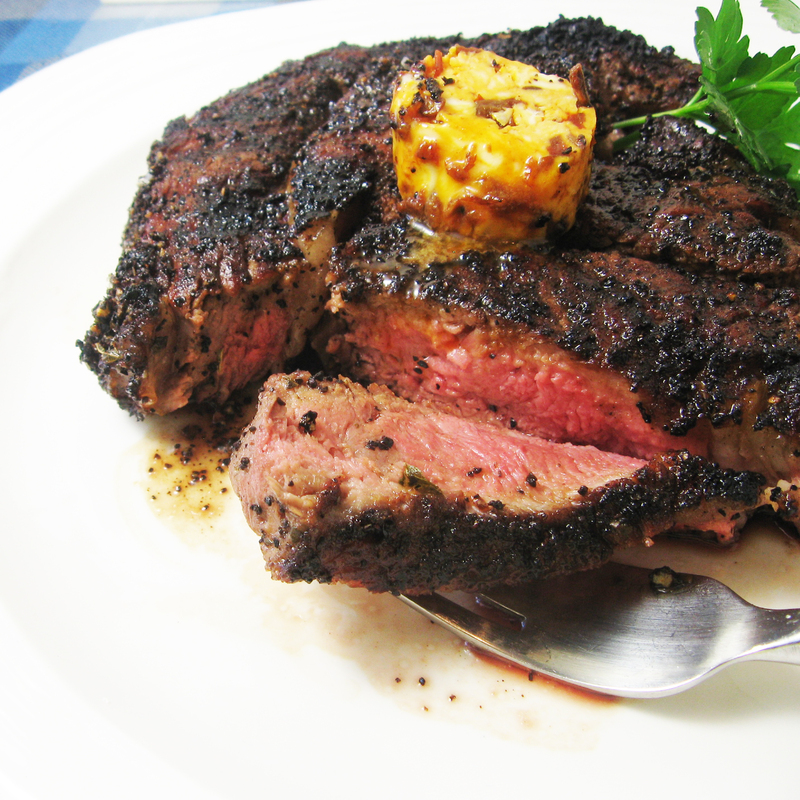 Take your steak out of the refrigerator 30 minutes to an hour before its time to start cooking. You want your beef to be at room temperature by the time you are ready to put it on the grill. The reasons? A cold steak takes longer to heat up and thus will dry out more. Additionally, a cold steak will contract as it makes contact with the hot grill, making it tougher. Preheat your grill until it is screaming hot. While the grill is preheating, stir together the coffee, brown sugar, black pepper, oregano and salt. Rub the mixture onto the steaks just before placing them on the grill. Place the meat on the grill and close the cover. Cook for 3.5 minutes per side, depending on the thickness of your steaks, for medium rare. Adjust the cooking time accordingly if you would like your steak more well done. Transfer steak to a serving plate and quickly top with a slice or two of the chipotle butter. Cover with a tent of foil and allow the meat to rest for about 10 minutes, during which time the butter will melt and the flavors will seep into the steak. Serve with plenty of vegetables alongside. Blend the softened butter with the chipotle, adobo sauce and season with salt and pepper to taste. Remove butter from bowl and spoon onto parchment paper or plastic wrap. Roll into a log, using the edge of a baking sheet to form a tight log. Chill for 2 hours or more before serving. You can store the butter tightly wrapped with plastic film in the refrigerator or freezer for up to three weeks. Bring to room temperature before using. I always knew to bring steaks to room temperature, but I never knew why. Thanks! Using chipotles and adobo sauce in the butter is brilliant. I use chipotles a lot and never know what to do with the sauce. I love chipotle in just about anything, but your coffee rub sounds wonderful as is too. The butter just takes it to a new level.